Marie Claire is giving a pouch as a promo gift with every purchase of their magazine, priced at 10 HKD. This promo gift comes in 5 bright colours of pink, green, red, yellow and blue. The magazine can be found at the bookstore in Hong Kong Airport. Marie Claire is a monthly women’s magazine. It originated in France but has since grown and is now distributed in many countries all over the world, in many different languages. The topics of the magazine include health, beauty and fashion. What makes a pouch an attractive promo gift is that it is a useful item for the readers. The pouch can be used to hold small health and beauty products needed during the day that usually get lost easily in the handbag. The brightly coloured pouches would not be misplaced easily in the handbag. Since these pouches are brightly coloured, they would stand out from the other magazines in the rack. This would give Marie Claire a competitive advantage, helping their sales to increase. Apart from that, the magazine is priced very attractively at 10 HKD, causing it to be even more attraction to customers as the purchase is worth the price paid. Although the magazine is mainly catered to women, men may also be attracted to purchase this issue for themselves or women they know as a result of the ongoing promo gift. This would further increase sales as the market reached is wider than the original target market of women. 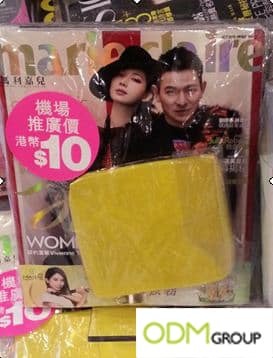 Marie Claire may brand its logo on the pouch in order to increase brand awareness and encourage people to purchase the magazine. The logo will also boost brand recall which encourages customers to make repeat purchases. This will boost sales in the long run. What do you think of this pouch?